October 30, 2017 | SoftBank Corp.
SoftBank Corp. (“SoftBank”), a subsidiary of SoftBank Group Corp., today announced that —as part of a consortium comprised of global companies NTT Communications, PCCW Global, PLDT, Facebook, Amazon— it has signed commercial agreements to build and operate a new trans-Pacific submarine cable system to be called “JUPITER,” with TE SubCom acting as system supplier. 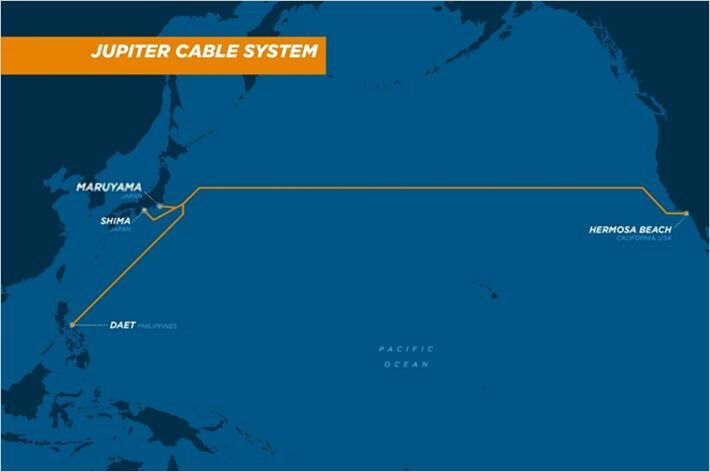 JUPITER is a fiber optic submarine cable system that will connect Japan, the US and the Philippines with a total extension of approximately 14,000 km. It will feature a state-of-the-art submersible ROADM (reconfigurable optical add/drop multiplexer) employing WSS (wavelength selective switch) for a gridless and flexible bandwidth configuration. With an initial design capacity of more than 60Tbps, the JUPITER submarine cable system is expected to be ready for service in early 2020 to meet rising demand and complement existing cable systems. Owned and operated by SoftBank, Maruyama Cable Landing Station (Maruyama CLS) will be one of the landings for JUPITER in Japan. SoftBank aims to continue contributing to the telecommunication industry through Maruyama CLS which serves as an important global gateway in Japan for international submarine cables. Anticipating exponential growth of IoT-related businesses, SoftBank is committed to building and optimizing its network infrastructure to support rapidly increasing traffic demand and its customers.